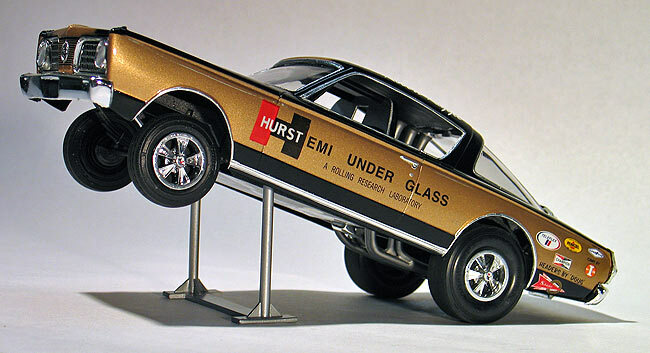 A few years ago, the old AMT Hurst Hemi Under Glass kit became available again through the Model King. I was really excited because I don't think this kit had ever been available on the shelves during my lifetime. 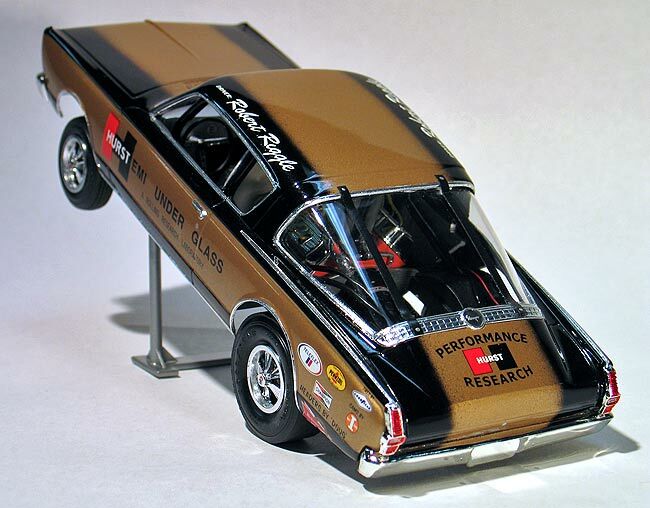 This was a great opportunity to build one of drag racing's most memorable cars. For me part of the fun in building a replica of a real car is doing research on it and looking for ways where I can improve upon what comes in the box. After studying the photographs I could find on the web I decided to build mine based on the original car as it ran in '66. First, I modified the kit body to make it more accurate. I removed the side vent windows and the molded in windshield wipers from the cowl. 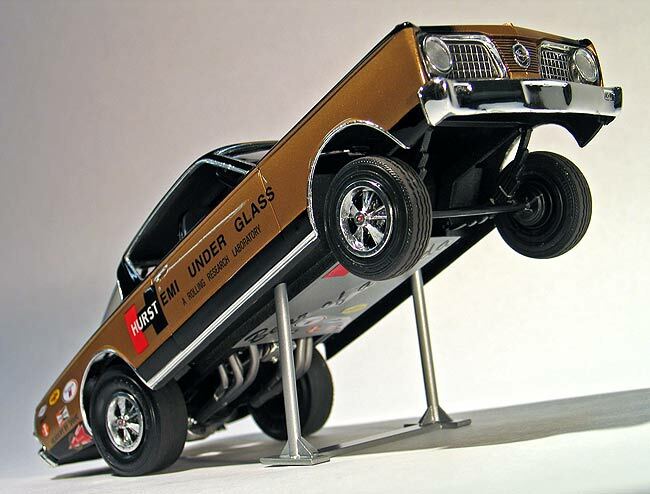 Then I primered the body and painted it with gold and black PPG automotive grade urethanes. 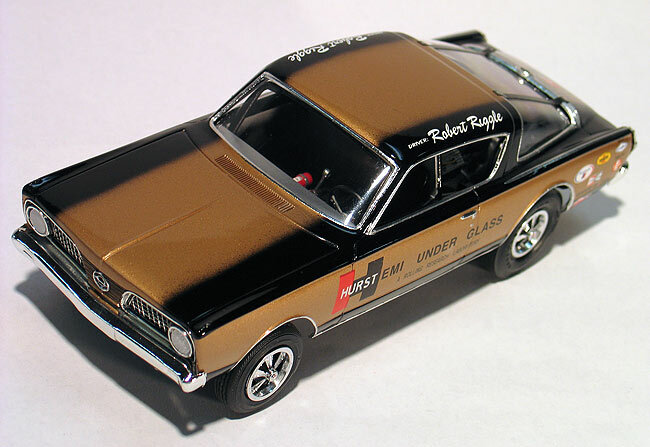 I also carefully airbrushed the hood, top, and roof with a proper fade from gold to black that matched the photos I had. For the graphics I used the decals available from Slixx and then covered the whole paint job with PPG concept 2000 clear. The chassis and interior was where I put the most effort into my replica. Based on the photos I had, they showed the engine needed to be positioned farther backward and upward in the chassis, so I modified the engine mounts so it could be moved to the right place. The kit instructions show mounting the rear axle facing forward with a drive shaft mounted to the transmission. My photos, on the other hand, showed the rear axle actually pointed backwards with a small half shaft mounted to a transfer case. I modified the rear axle to mount correctly and scratch built a transfer case from some different pieces I found in my parts box. A further trip to the parts box netted a more accurate looking transmission and headers, plus a correct fuel injection system to replace the blower setup. Next, I plumbed and wired the Hemi engine. Lastly, I added a belly pan I made from sheet styrene to the chassis. After trying to decide how to modify the interior tub to correct for the new engine location, I decided it would be easier to just start with something else. I ended up using the multi-piece interior from the AMT '66 Nova Pro Street kit and then heavily modifying it to fit properly. I also scratch built a new roll cage and interior firewall based on my photos. Even though the real car did not have a straight axle front suspension, I decided I could live with it and used what came in the box. Although I did modify the ride height a little. 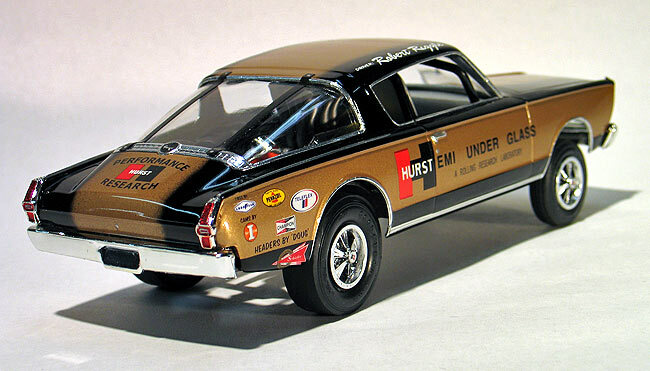 The original car used Hurst mag wheels which are different from what comes in the kit. I bought a set of resin cast wheels from Model Car World and then painted them with Alclad to get the chrome finish. Lastly, I added a set of aluminum head light covers and safety straps for the back window. 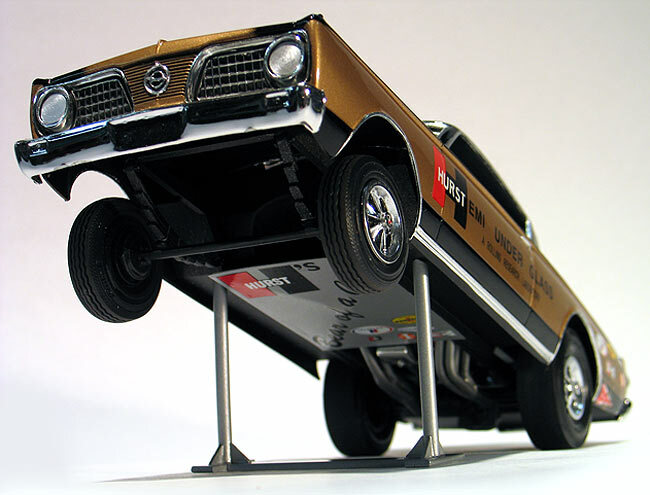 For the crowning touch I wanted to display the car "wheels up" so I scratch built a stand so it would look like it's in action.